Ayurveda, India’s age old medical science, classifies food into sattvic (goodness), rajasic (passion) and tamasic (ignorance) modes. Foods in the mode of goodness or sattvik foods are said to be without meat, fish, eggs, alcohol, caffeine, onions and garlic. The use of onions and garlic is especially prevalent in North Indian cooking, which has been heavily influenced by the Moghuls who ruled India between 1526 to 1761. This tradition gradually trickled down south. But, even today traditional South Indian vegetarian cuisine is probably one of the most prominent foods that hardly uses onions and garlic and even to this day if you visit an orthodox South Indian household you will find many dishes prepared without them (also, if you visit any strict vegetarian Buddhist,Thai, Vietnamese, Chinese or Japanese restaurants around the world, you are most likely to find any members of the allium family missing from the food). The iconic South Indian vegetarian classic cookbook Samaithu Paar or the English version “Cook And See”, published in the 1950‘s, considered the pioneer of starting the trend of publishing cookbooks in India and still known as a bible for young brides and for those who want to learn the nuances of South Indian vegetarian cuisine has a total of 350 dishes in it. It might surprise you that only 5% of these dishes have onions and garlic in them with the word optional mentioned in the brackets for those recipes which happen to use them. This corroborates the absence of onions and garlic from South Indian vegetarian cuisine. We as a family, love sattvik meals and on a sunday afternoon, when I was lunching at “Dakshin” at the ITC Maratha, which happens to be a favourite with me and Ro for a long time now, the server brought in a succulent dish “manga curry” (a curry prepared with mangoes in season) specially sent by the chef for me to try, apart from our usual staples of Iyer’s trolley (consisting of a variety of miniature dosas), appam, vegetable stew, ennai kathrikai (a spicy eggplant curry) and biranji (vegetable biriyani). When the chef came in to have a word at the end of our meal, I thought that although I don’t do restaurant reviews here, I must share with you at times, the food I eat outside apart from the dishes that emerge from my kitchen. And also showcase talented chefs who create magic in their kitchens. And I thought what better place to start with than the Dakshin at the ITC Maratha, a hotel which Ro and I have been visiting right from its inception. Chef Manu Nair, a very enthusiastic and talented young chef from Dakshin restaurant at the ITC Maratha created an exhaustive spread of sattvik South Indian meal specially for DivineTaste consisting of Alvemandi Podi, a spicy savoury dish from the Saraswat community of Karnataka made with colocasia or arbi served with a spicy chili chutney called Korivikaram Chutney from Andhra Pradesh, Kalan, a Keralan dish made with raw bananas and yam and cooked in a mild coconut gravy, Pumpkin Erissery, another exotic traditional Keralan dish, Olan made with black eyed peas and white gourd, something that I really relished, Tindli Bibo Upkari, a Saraswat Brahmin dish from Karnataka made with tendli or ring gourd (known to be a favourite of the cricket maestro Sachin Tendulkar and also a dish which originates from his community), Tarkari Padartha, a vegetable dish in a mildly spiced tomato and cashew gravy, Menaskai, spicy sweet dish from Udupi in Karnataka, Manga Curry, a country style ripe mango and coconut curry, Parippu Kootan, a festive Dal from Kerala and tropical dry fruit payasam, a sweet dish from the temples of Tamil Nadu! 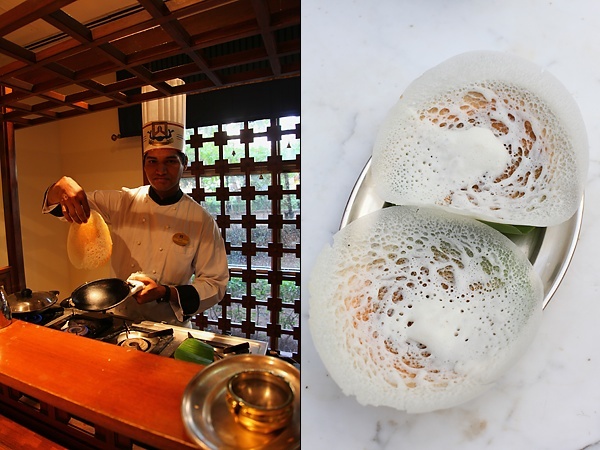 Appams, steamed rice, podis or dry chutney powder and the signature Dakshin pappadams completed the menu. Each and every dish was cooked to perfection and it was also a visual feast for the eyes. The colocasia chips were so delicious that I couldnt stop eating one after the other. The other favourites were olan which was such a simple curry and with hot rice was a great comfort food for me and the kerala style dal. 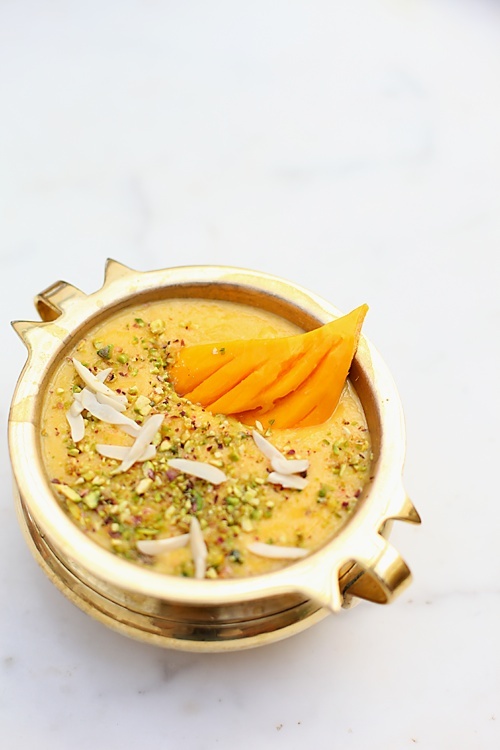 The payasam made with mangoes and garnished with dry fruits was the perfect end to this grand meal. It was truly a meal fit for a king! The ITC hotels place a lot of emphasis on food in their restaurants and great attention is given to the quality and consistency of food throughout their restaurants across many cities. And that is why you are likely to taste the same chutney or appam at Dakshin in ITC Windsor, Bangalore (known as Windsor Manor way back in the 80's which used to be my childhood favourite) like the Dakshin in Mumbai. 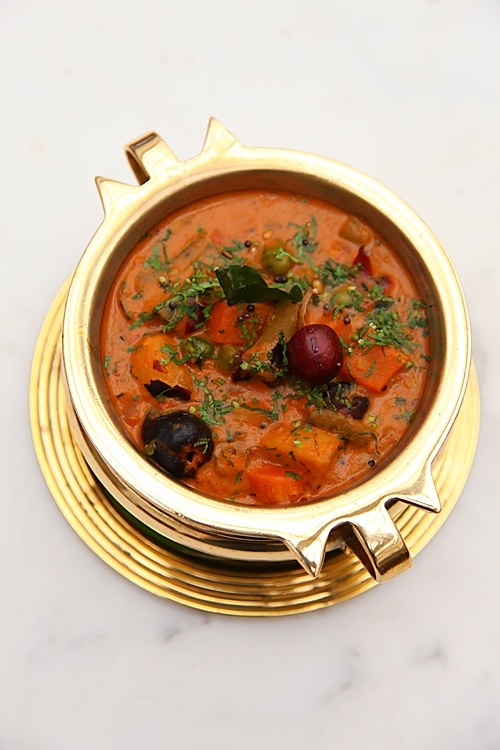 Likewise for their famous dal bukhara which is supposed to taste the same at ITC Maurya in Delhi or Chola in Chennai. Chef Manu who comes from a family of engineers and bankers, faced a lot of opposition from his family but still chose to follow his heart and become a chef! Post the extensive shoot when we were in conversation, Aishwarya from the hotel management pointed out that it is families who carry on the traditions of the many cuisines around the world and in most cases, one family member would have influenced a chef to don the apron and cook up a storm. In Chef Manu’s case, it was his grandmother's exceptional cooking that stirred up the emotions in him to follow his passion and he says that it is she who inspires him to this day. 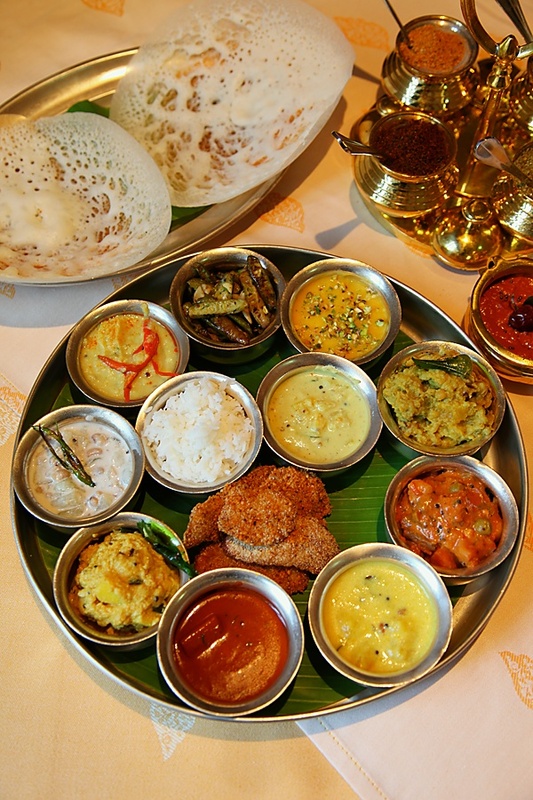 The cuisine of the 4 South Indian states is so vast with a number of regional variations to each state. Chef Manu has presented these dishes to represent each state. The beauty of these dishes, unlike other hotel menus are that most of them are cooked and eaten at home and have a history and tradition attached to them. In order to recreate the magic of many of these dishes at home, I’m including the recipes from Chef Manu’s kitchen at the ITC Maratha, Mumbai. 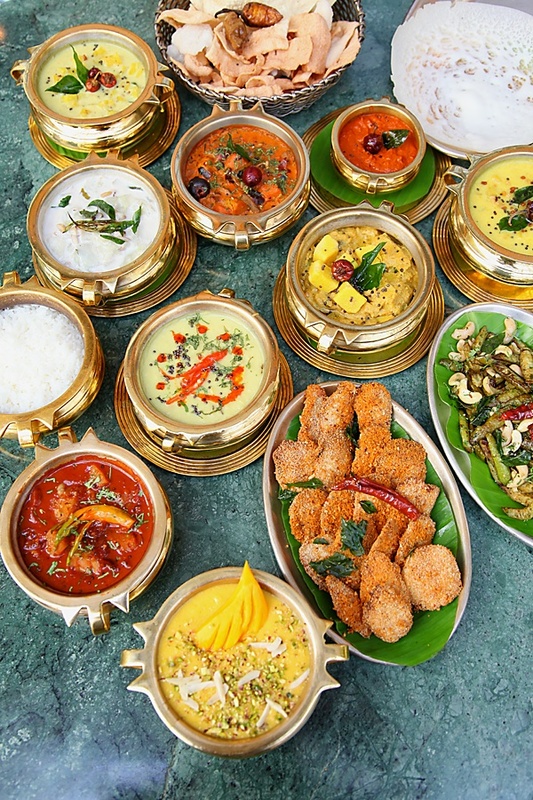 You could also reserve a table (+91 28303030) to experience and savour many traditional south Indian delicacies from the menu at the Dakshin, ITC Maratha, Mumbai. 1) Wash the arbi, peel it and allow it to boil with salt, tamarind and turmeric powder. 2) Allow it to cool. 3) Marinate the boiled arbi with salt, lemon juice, red chilly paste. 4) Coat it with rawa (semolina) and press firmly to ensure that rawa is evenly coated. 6) Toss again with gun powder or red chilly powder, toss and serve crispy hot. A spicy chutney from Andhra. Try using salem chilies if you can lay your hands on some. 1) Soak tamarind pulp, red chilies (without the stem) and salt for 10-15 mins. 2) Grind the above mixture into a very coarse mix. 3) Place the mixture in a pickle jar/ bharani and allow it to rest for 3-4 days. 5) Heat oil add mustard, curry leaf, red chilies and hing and allow it to crackle. 6) Add the tempering into the paste and serve with steamed rice/ dosais. 1)Lightly roast the beans and soak it in water for 8 hrs. Wash & strain well. 2) Extract thick milk and thin milk from the grated coconut. 3)In a pressure pan, add beans, both vegetables, chilies and thin coconut milk. 4) Pressure cook up to 1 whistle. 7) Add coconut oil and curry leaves. Serve hot with steam rice. 1.Soak cashewnuts in warm water with little salt. 2.Cut the tindli into quarters; ensure that they are green and not red from inside. 3.Blanch the tindli and keep aside. 4.In a kadai, heat oil, add tempering and red chillies and allow to crackle. 5.Add curry leaf and asafetida and cook for a while. 6.Add the soaked cashewnuts and tindli and toss. 7.Add grated coconut and salt and mix. Serve hot with steam rice and sambar. 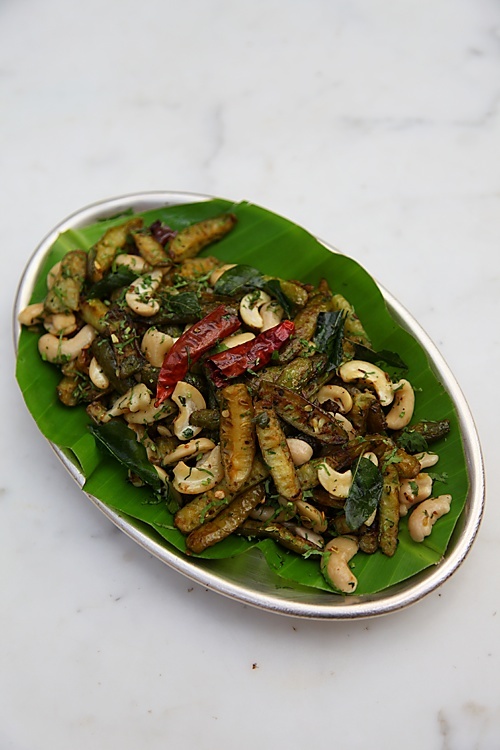 A mixed vegetable dish from Mangalore, great as an accompaniment to rice or chapatis. 2. Heat oil in a handi, add mustard, red chillies and curry leaf. 3. Once it starts to crackle, add the tomato puree and cashewnut paste. 4. Add some water, mix well and allow the gravy to cook. 5. Add the masala powders and allow to cook till the gravy starts to leave oil on the sides. 6. Once the gravy starts leaving water, add the cut vegetables. 7. Mix well and cook till the vegetables are well cooked. 8. Heat ghee in a pan, add the green chillies and fry it till golden brown. 9. Add the oil and green chillies on top of the gravy and keep it covered. 10.Remove from heat and serve hot with Veechu parathas or appams. 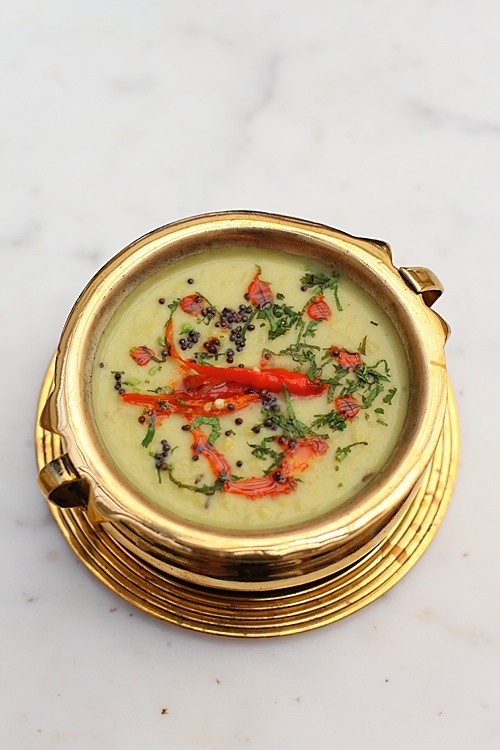 Served during a traditional sadhya, this festive dal is a great variation to the simple dal and adds zing to a meal. 2. Grind grated coconut, cumin and green chilies into a fine paste. 3. Add the ground coconut paste into the dal and mix well and allow to simmer. 4. Heat ghee, add mustard red chilies and curry leaves. Once it begins to splatter, add the tadka into the dal. 5. Cover the gravy for 5-10 mins and serve hot with steamed rice. 1. 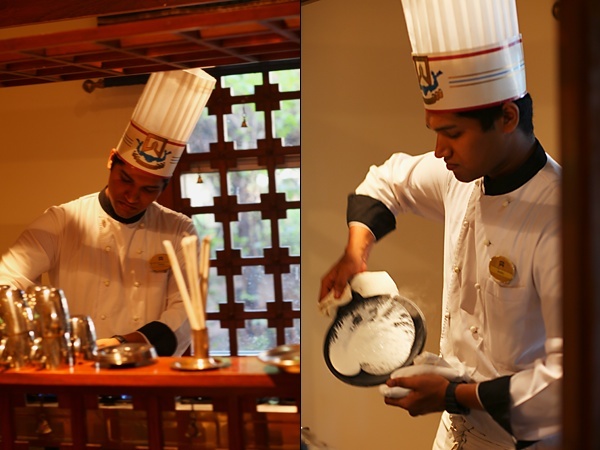 Boil milk in a handi, add sugar, cardamom powder and rice flour to it and allow the milk to thicken and reduce. 2. Allow the mixture to cool. 3. Boil the above nuts and cut into fine pieces. 4. Add the nuts into the reduced milk. 5. Make mango pulp/ puree and mix the mango pulp into the reduced milk. Hope you will continue with restaurant reviews like this one..
Wow! This is a fantastic post. Thanks so much! I have also been following your blog for a long time now (your droolworthy photographs in particular make it hard not to!). 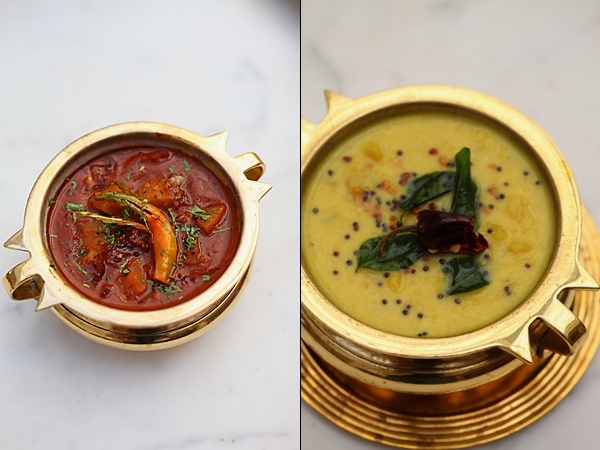 What a treat to have these recipes from Dakshin's kitchen. Thank you for sharing. Lovely post with great clicks. Have been trying a lot of your recipes with great success. Thank you. What a delicious spread! !The alvamande phodi and tendli bibbe upkari which is regular Konkani fare looks so spectacular.Thanks for such a wonderful visual treat! Beautiful post… Love all the photos. Everything looks mouthwatering! Shimsha, Simi, Vidya: Great to hear from you guys! Hope to hear more often from you. Poornima: Nice to know that you have been trying my recipes with success. Thank you for your feedback. Divya & Chinmayie: Glad you'l liked it! hey.. Awesome post.. I absolutely love Dakshin too.. have been there many times and absolutely love the eggplant curry and appams!! Hi, Anushruti; a lovely post, but I'm learning that with Divine Taste that's only par for the course! :) I was wondering if you could enlighten me as to why onions and garlic are not considered sattvik. As far as I know, both have several health benefits, with no side effects either. I've tried to find out on earlier occasions as well, but I couldn't find anything scientific. I was hoping you could help me out:) Thanks! Such a nice spread and an awesome post..nice recipes and would love 2 give a try…can u share d recipe of manga curry too?? Such a visual treat!!! And yes..being a Keralite, needless to say I loved the spread.. and so good to see the face behind getting mentioned. Usually restaurant reviews are about the spread and very rarely about these talented people..
And u pointed one thing right..in many places abroad, Indian food is so synonymous to the ones with onion n garlic that many people are not aware that there exists dishes which do not use these..and for those readers, this will be a great to know fact..Keep rocking! Been a silent reader so far..love the calmness in your blog. Thanks for such a beautiful post on sattvik food.. look forward to more. WOW! !… is all I can say after reading this post and glancing through the pics! I am lucky to read this post and get my hand on recipes of such rare, exotic, traditional cuisines from south India! Thanks a lot for this post Anu! Great pictures and the food looks mouth watering….. 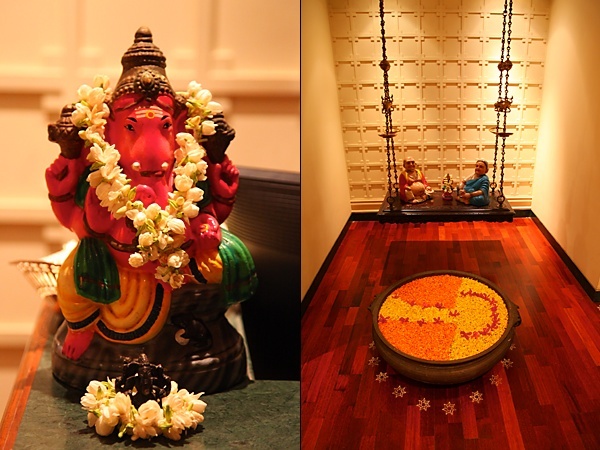 Looking forward to visit dakshin soon…. Wow Anushruti, if I was a chef, I couldn't have asked for a better reviewer or review. The effort you have put in (and of course Mr.Manu Nair and the staff too) is breathtaking. Such a delicious spread, such beautiful photos, so much of information and of course, the recipes. Absolutely fantastic. Makes me want to visit ITC Maratha asap and I will, as soon as I possibly can. Thank you so much, this post is truly delightful in every way. Such a delightful post!! I am so hungry now!! 🙂 But I am feeling happy, I am relocating to India (yay!!) next week and all I can think of is gorgeous food all around me, hehe!! This post of yours is particularly bookmarked, I HAVE to try all these recipes, some of them are already my favorites and some of them I have never hear of. Thanks for sharing!! your blog is a feast to the eyes and soul. a beautiful post. i loved that squeezed out lemon halves next to arbi fry. a fabulous spread, very well written… thanks for sharing! I've been reading your blog for a while now and this is my first comment. Love the pictures and description in all your posts. I like that you minimize the use of onion/garlic/eggs, which suits a south indian like me just fine (I'm a Kannadiga from Bangalore). This post was excellent. I am so inspired to cook these dishes, especially given that they're straight from the horse's mouth so to speak…the chefs at ITC do such a wonderful job always. Wow!! love the post, love the description, the pictures and everything about it!! 3 CHEERS!!!! TO ANU AND MANU!!!!!! Hope we don't become like that seth and sethani…..sitting on that swing after eating soo many things(jus jokin)….never mind we can always work out on extra hours in yoga…or else hit the gym….but no compromise on eating…..right! am gonna try all this…. Came to your blog via Kamini's blog. Beautifully written and also great pictures. Enjoyed the whole writeup and hope to enjoy the lovely recipes you shared. Thank you for sharing the recipes. Wonderful post and even more wonderful are the receipes so well written! I am a believer of 'You are what you eat' so sattvic food ranks high on our dining table. I'm raising my daughter who's almost two and a half with sattvic food! Can't tell you how happy I'm to see so many sattvic receipes in one go! Thank you everybody for your comments and feedback! pratibha: Its a simply gravy..cook mangoes with turmeric, salt and water. Make a paste of coconut, green chili and cumin. Add this paste to the simmering water. Stir in some yogurt and cook on low heat. Give seasoning mustard, fenugreek, curry leaves and dry red chili. vidya: That's a very important point. Thanks for sharing. Ashwini: Hope you are doing well..when I don't hear from regular commenters like you for a long time, I wonder if all is well with you. Great to hear from you! Poornima: Thank you for your kind words. You are a sweetheart! Deepa: Thanks for noticing the minute details and the efforts that I put in behind every post. Ambika: Great that you are moving back! Look forward to great posts from you! Manjari: Nice to know that you are raising your daughter on sattvik food. It will do her body, mind and intellect a great deal of good and you will reap the benefits as you watch her grow. All the best to you! I checked out the links you posted. Thanks so much…It was a very informative read! I am always trying to cook and eat food which is good for my body and mind, and this was a real eye opener! wow… a fantastic post. the pics.. the recipes everything. thanks for sharing.. would surely try some of the recipes, especially the colocasia fries. Lovely coverage of the meal at Dakshin. Its been a favourite of mine for as long as I was in Bangalore. Great pictures as usual too! Such a lovely write-up. 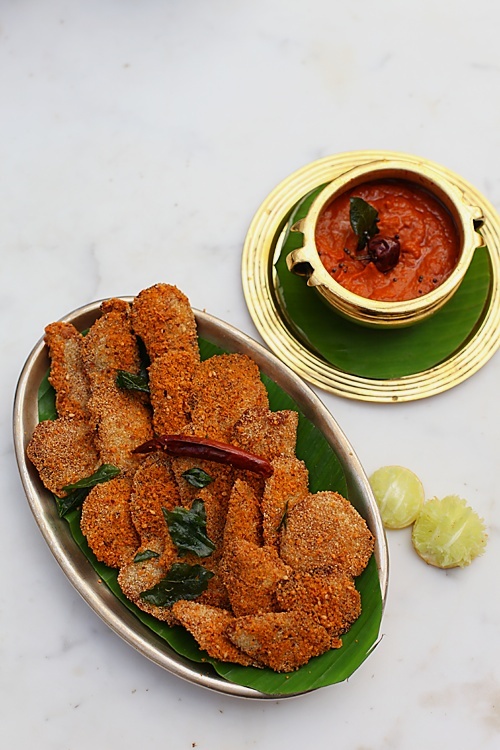 I'm going to try the arbi fry pronto. Thanks for sharing. Hi Anu, wonderful post. Great info about onion and garlic. Could you please clarify the recipe for tarkari padartha, is the qty for tomato paste and cashew paste actually 4 cups each? It seemed like it might be be a bit much. Thanks for the recipes. 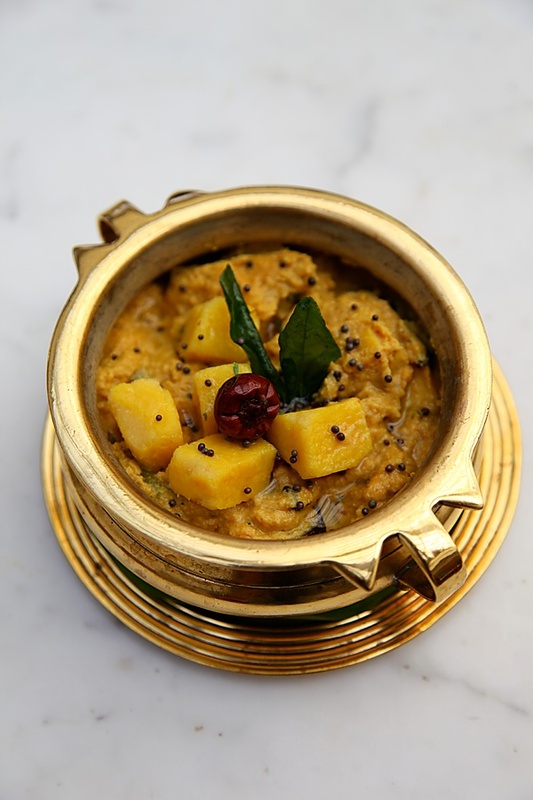 Beautiful presentation of Dakshin sattvik south indian menu, one of the best from rest internet reviews. Note: I agree with comment 38 about quantity of cashewnut paste. 4 cup paste is out of proportion for sattvic style cooking. Cashews are very hot in property so need to be delicately used.What kind of dry round red chilies are used for end tempering? Please re-read recipe, it sure needs some corrections.When recipes are given by top five star chefs, people will blindly follow without reasoning, they should have rechecked recipes before passing. I just adore your blog, so many interesting recipes and the pictures of the food are really so divine! I often read blogs such as vaishali's holy cow, vegan dad, fat free vegan and India vegan for tips , ideas and recipes. Thanks again for posting many vegan recipes, which is good not only good for our health, but also for our environment. Vidya: The ratio of tomatoes and cashews are equal in proportion in the recipe. For home cooking you can reduce the cashews and use 1/2 a cup or skip it altogether and use more tomatoes and a little sugar to cut the sourness of the tomatoes in the gravy. Sattvik: When cashews are soaked and blended and cooked they become less heating to the body and the amount of cashews going inside a body would be just a few tablespoons. 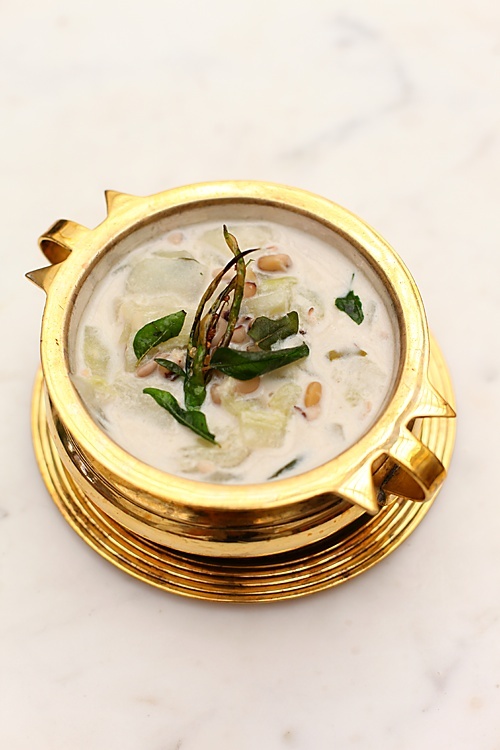 And cashews are used as a substitute to onions in the recipe here and cashews are anyday an acceptable substitute to onions in sattvik cooking. I agree that the quantity of cashews used in the recipe for homestyle cooking maybe a little too much so you can reduce or omit them altogether. With over 75,000 pageviews a month, I have a certain duty towards my readers and a lot of efforts go into what is published here. And I would not publish anything here without checking it. Kumudha: Thanks for your comment and concern. Many of the recipes here are naturally vegan. I like to stick to traditional vedic style of cooking and many of them use dairy as a lot of emphasis is given to milk and milk products in ancient cooking. I totally agree with you that cows are in a bad state and they are not treated as they should be or as they were in olden days where they were well tended to, happy and produced enough milk for the calves and for the families who kept them. That is why I try to buy milk from dairies where I know they are treated fairly well! This looks like a dream feast. Utterly amazing. Love the dishes too! Hey Anu! Thanks for the concern. I am good.. 🙂 Have been slightly busy with travels going on.. I made ALVEMANDE PODI and PARRIPU KOOTAN last night and they came out superbly delicious! It was enjoyed by all. I was especially happy to serve that to my mother who is a great cook herself and who has been serving me with her delicacies all these days.. Hope to get more recipes of such rare, traditional dishes from your space! Just came across your blog today, and it is LOVELY. Amazing pictures and great writeups. I love the idea of satvik food that is so tasty and not at all about deprivation from taste. This post is so great to showcase tasty home cooking that is different from the stereotype heavy, oily, spicy restaurant food. One question: WHERE to source those beautiful little urulis for serving? Are they really food safe? Thanks! Another question: someone upthread rightly pointed out the miserable treatment of dairy animals, and you agreed and said you only purchased from reputable dairies which treat their animals well. Can you please share which these dairy farms are, and how you have determined they do not illtreat the animals? I am sure many people would appreciate the information, and if this awareness spreads, then other operations will also follow suit. Thanks in advance! Its very nice information. Indian delicacies have maintained their traditional cooking techniques and spices. When making a choice of the restaurant to have the authentic Indian cuisines one should be well informed of the different Indian main meals and desserts. Ashwini: Glad you enjoyed the alvemandi podi and kootan. with pics and clips, this site could certainly be one of the most beneficial in its niche. I enjoy going through your website, more so because it is one of the few which give recipes which are not just vegetarian, but also omit onion and garlic. Though I am not completely averse to it, at home, the food we prepare usually does not have onions and garlic (most gujarati brahmins, vaishnav and jain families do not have onion and garlic). Most of my friends are unable to comprehend how anyone can prepare majority of foods without adding the two. Guess it is similar to our western friends who are surprised with the extent of vegetarianism in India. Thankuuuuuuuuuuuuuuuuuuuuuuuuu…that's all I can say. Its been a pleasure reading this delicious looking post about "Satvik" recipes (and I promise I'll try my best to make all of these). Already tried one today of mango payasam ^.^ with a twist of using a thick mango (& certain other fruits) mixed fruit juice in the payasam, but the flavor is awesome. My husband loved this new recipe and I'm gonna try it again & again. I will be recommending this recipe for sure to others as well. Thanks for your interest Shweta. Look forward to hearing more from you. What's up, after reading this amazing paragraph i am also happy to share my familiarity here with colleagues. to own a machine that only shapes metal into one form. hey lukin forward for more dishes. Hey! Really awesome to read the reviews and recipes. I am from Chennai and it is really difficult( read impossible) to buy satvik food. So since very recently we moved on to saathvik lifestyle, I am exploring the various options. Thank you so much. Good job. Keep going. Abinayah: I know how difficult it can be down south to get sattvik food options. Hope you find options to cater to your needs in this space of mine. You have such a wonderful blog and i try many recipeswhich is a great hit with my family. Though i am an orthodox tamil brahmin, i stick to the usual sambar-rasam (sans onion-garlc), everyday and occasionally i do try pulaosor sabzis adding onions and ginger garlic. Onion and garlic cannot be said they are unsuitable cos after both my pregnancies my folks gave garlic daily to increase my milk supply. I ate garlic for almost an year and found it very beneficial. My grandad was asked to eat raw garlic daily to bring down his high sugar levels. Mini: I'm glad you asked this question. Onions and garlic do have some health properties, there is no disputing that. The Bhagavad Gita classifies food into Sattvik (mode of goodness), rajasik (mode of passion) and tamsik (mode of ignorance) categories. And onions and garlic fall into the tamasik category. And if one is interested in pursuing a holistic way of life based on ancient vedic scriptures, it is better to avoid onions and garlic. 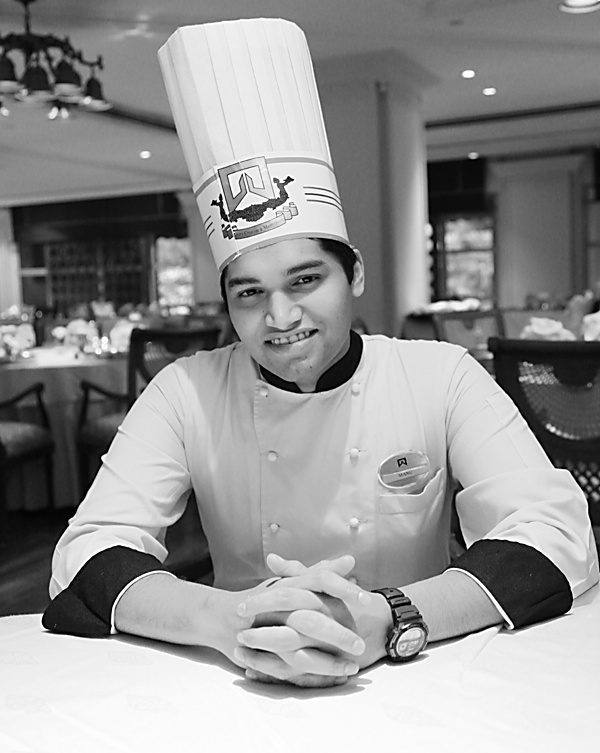 Compliments to Chef Manu, who shared his recipes with us. I love south Indian cuisine. As if I make some south Indian dishes at home but you gave me some new ideas. Thanks for sharing such recipes. Out of all dishes I like ALVEMANDE PODI.It;s recipe seems to be easy.Thanks for sharing delicious south Indian recipes. dear anushruti, please accept my countless appreaciations and thanks for your great work. selma- Soak cashew nuts in water for 30 minutes and blend into a smooth paste using a little water. Hope this helps. My friend recommended your blog to me as being a vegetarian, I keep on looking for eggless options. I had liked it and made your mango mousse a few times, which was a great hit in our home. This particular post is awesome. You have pictured the dishes so beautifully. Thank you for a wonderful article. I will be trying all the recipes given here. Sandhya- Good to know this. Do try the recipes and give me the feedback. Thanks for the detailed recipes and varieties. I am in love with south indian meal and dishes. Thanks so much for sharing this detailed post. Just loved it.